#mathschatNZ is a fortnightly Twitter chat for maths educators, Thursdays 8:30pm-9:30pm (NZ time). It's also great for sharing ideas & resources whenever! The official #mathschatnz chat is fortnightly, alternating with the fortnightly #edchatnz chats. You can also use the hashtag #mathschatnz for any resources, ideas or questions that come up any time, not just during the chat. 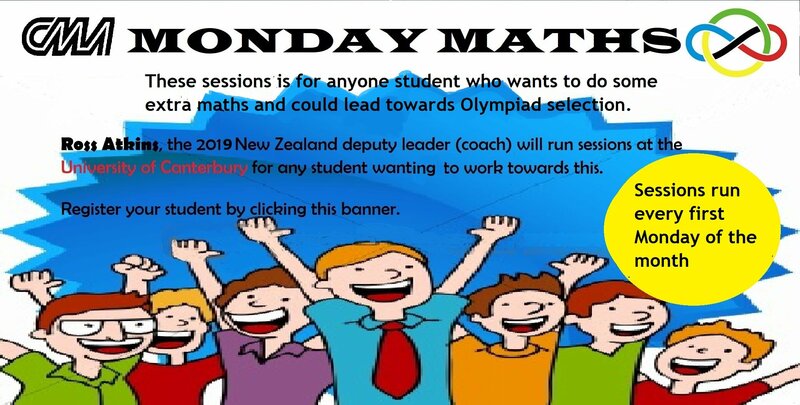 Canterbury Mathematical Association, University of Canterbury and New Zealand Mathematical Olympiad are running some enrichment sessions at University of Canterbury throughout 2018. These run on the second Monday of every month. Please do not use sign up sheets from previous years to sign up to the CMA. Membership has changed as it is now based on school size; a link to sign-up will be on this page soon.